Reusable PEEK™ Reservoirs available in two sizes. 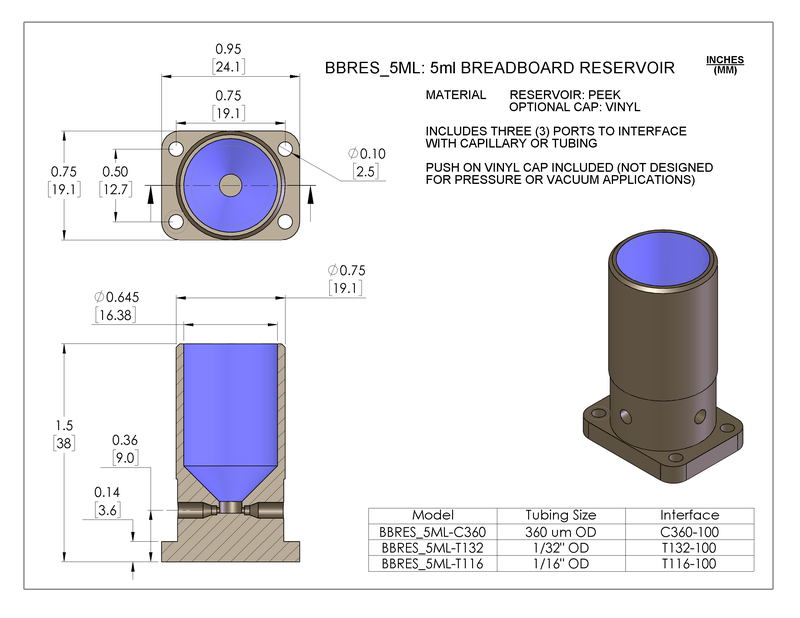 BBRES-1ML 1.1 mL reservoir with sealable cap. Includes four ports for direct connection to capillary or tubing (three in reservoir and one in cap). Cap seals with Viton® o-ring (two included) for vacuum or pressure applications. Max pressure 1800 kPa (250 psi). BBRES-5ML (NEW!) 5 mL reservoir with push on Vinyl cap. Reservoir has three ports for direct connection to capillary or tubing. Not designed for pressure or vacuum applications. Download BBRES-5ML drawing. Both reservoir sizes available for connection to 360 um OD (-C360), 1/32" OD (-T132), or 1/16" OD (-T116) tubing. Reservoir ports connect to capillary or tubing via CapTite one-piece fittings and/or plugs (not included). Can be mounted to LabSmith standard breadboards or uProcess breadboards.